My own Parmigiana story has less exotic origins! It all started in Fulham, southwest London. A good friend stumbled upon a glowing (and well deserved) review of a little Italian eatery called Nuova Luna and suggested we try it. So one Friday evening in early May, not quite knowing what to expect, four of us arrived at Nuova Luna. It really is tiny, but we had a nice table in front of the bar and its small proportions enhanced the atmosphere rather than making it feel overcrowded. Our supper friendly waitress (think US-style customer service coupled with genuine Italian warmth and passion!) suggested we kick things off with a few tapas. The signature veal was recommended but one of our party isn’t a fan so we settled on some others instead. We were brought the veal anyway to try – on the house, of course. Nuova Luna was exceeding our expectations already and we had yet to taste anything! The food did not disappoint. 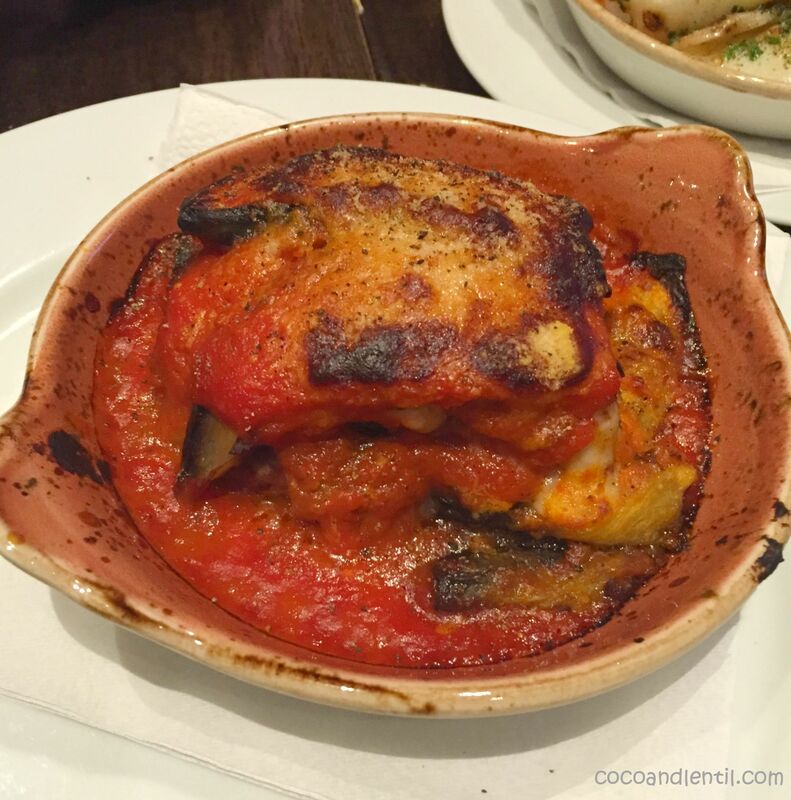 The Parmigiana was packed full of flavour: layer upon layer of juicy aubergines, creamy tomato sauce and Parmesan, naturally. 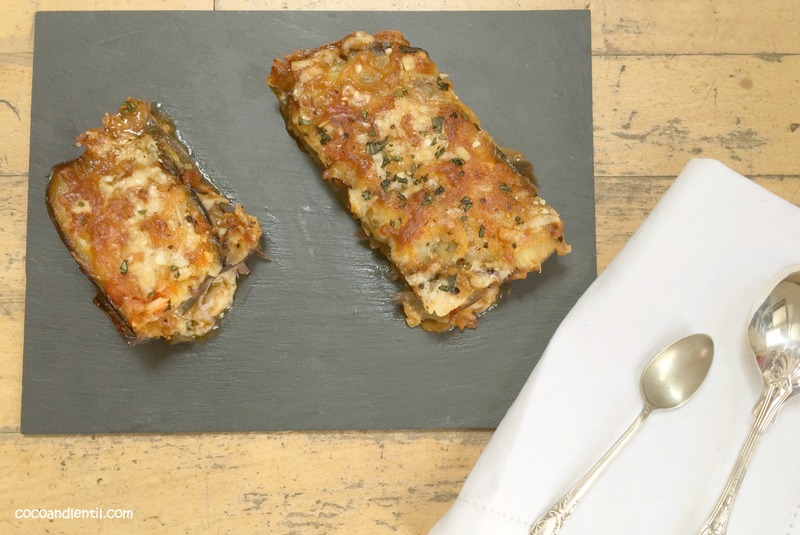 Perfectly balanced and, unlike many Parmigiana recipes, not too oily. Just divine! I was determined to try to recreate this sumptuous dish at home. I wanted to try a healthier version, which Coco and Lentil could enjoy too, hopefully without compromising on flavour. I was going to need some help! I flicked through our modern, glossy recipe books which share Italian recipes, but to no avail. I struggled to find any Parmigiana recipes in our modern cookbooks. It was time to go back to basics and dust off one of my mother’s cooking aids. 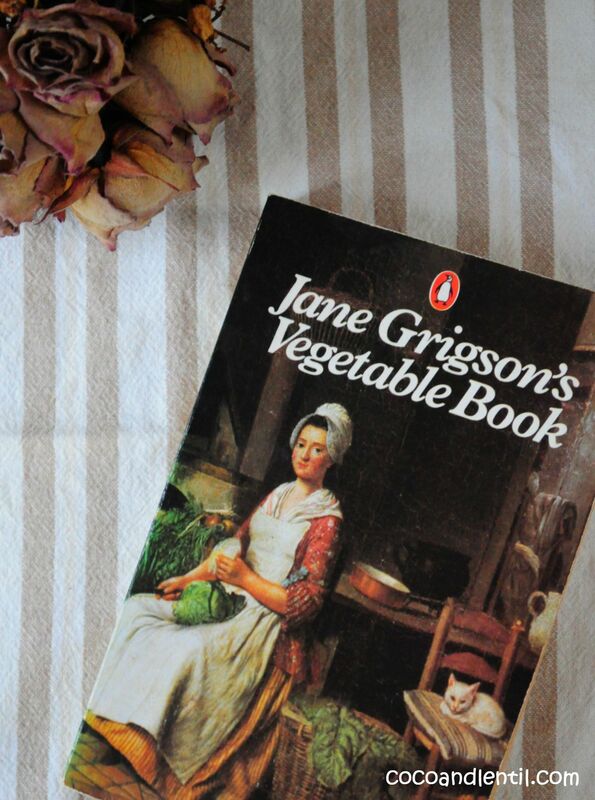 And so I stumbled upon Jane Grigson’s Vegetable Book. There are 15 pages dedicated to aubergine recipes! What caught my interest was her suggestion that one avoids too oily a Parmigiana by only frying between one-third and one-half of the aubergine slices, blanching the remainder in boiling water. I then found that [check name] adds a little lemon juice to the blanching water, which sounded good (and VERY healthy!). I tried one version with one-third fried aubergine slices, the remainder blanched and one version blanching all and not frying any. There was no difference in taste and in fact I preferred the texture of the all blanching method. Most recipes also recommend salting the aubergines before cooking, but wanting to avoid any added salt (particularly for Coco) I avoided this step. It didn’t take from the dish. To achieve a really creamy tomato sauce Nuova Luna-style a large helping of tomatoes is a must (I only used fresh tomatoes on my first attempt and not enough of them). My final recipe uses both fresh and tinned tomatoes, which means you can make this dish in winter too when fresh tomatoes are in shorter supply – yay! Breaking with tradition I also decided to add a little creme fraiche to the tomato sauce. I think it would be anathema not to include Parmesan in this dish, but some recipes advocate using softer cheeses such as mozzarella, or a combination of both. Carluccio pairs Parmesan with fontina, an Italian cow’s milk cheese, which is soft in texture and melts well. Grigson recommends Parmesan and mozzarella, [“due to its softness“] or if [“you can’t find mozzarella (I’m guessing mozzarella was not a supermarket staple back in 1978 when her book was first published!)] Port Salut or Bel Paese are [good] substitutes. I suspect Bel Paese may be the most difficult to acquire these days – I couldn’t find it in any of the big supermarkets. I opted for mozzarella, grated hard mozzarella, although Gino D’Acampo and Oliver use Buffalo mozzarella instead. 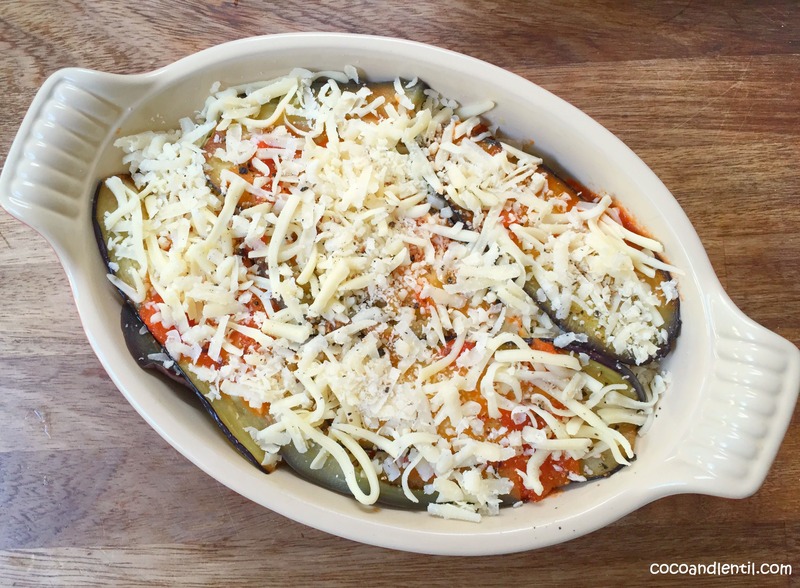 More modern Parmigiana recipes add meat, such as chicken or veal and Carluccio suggests using courgettes, although I’m not sure if that is in addition to, or instead of, aubergines. 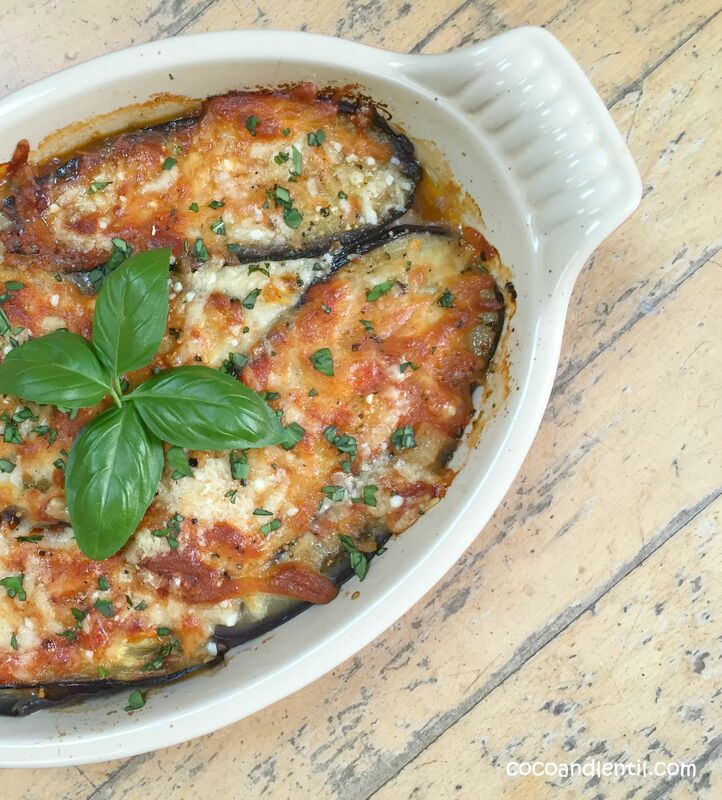 I’m for keeping the aubergines as they are such an integral ingredient of this dish. 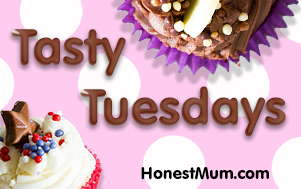 Feel free to play around with my recipe though and try some of these other ingredients, just be such to let me know how you get on and send me some photos! Slice aubergines lengthways and wash and pat dry with kitchen paper. Blanch the tomatoes in boiling water to split the skin. Remove with a slotted spoon, remove skin and seeds and chop into chunks. Add 2 tsp of lemon juice to a saucepan of boiling water and blanch the aubergine slices in batches for 1-2 minutes. Heat the olive oil in a sauté pan, add the garlic and cook for 1 minute until soft. Next add the tomatoes, oregano, sage and basil, bring to the boil and simmer for 20 minutes, stirring occasionally. Add the creme fraiche and cook for a further 10 minutes. Lightly grease an ovenproof dish with olive oil. Line the bottom with a layer of aubergine. Spread with tomato sauce, then mozzarella, Parmesan and season with some pepper. Repeat each layer, finishing with a layer of cheese. Bake in oven for 20 – 25 minutes until golden. Tear some fresh basil leaves and sprinkle on top. This looks amazing! I have pinned this and will definitly be giving it a try. 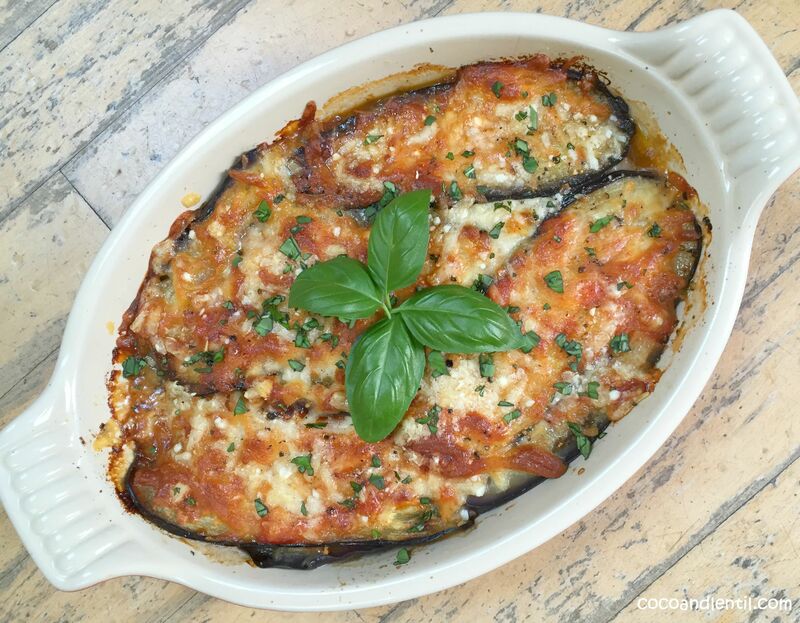 I’ve never had aubergine before as I have never thought it looks that great…but this looks delish! Oooh I love this dish! But find the whole frying the aubergine (and some recipes call for salting first too) a bit of a faff. Haven’t heard of blanching them before – sounds like a winner!